You may know that some media websites use what’s called a “fact checker”. Face checkers verify the claim that an article or web page is making with external resources like other articles, PDFs, or web-documented evidence. Some fact-checking organizations, like PolitiFact, will manually verify claims. But this new generation of fact checker is powered by artificial intelligence. With so much content being published across the web every day – and “fake news” a pernicious problem in the media industry – expect these AI-enabled fact checkers to become even more common. Fact checkers only work insofar as they can link to reliable sources of information. 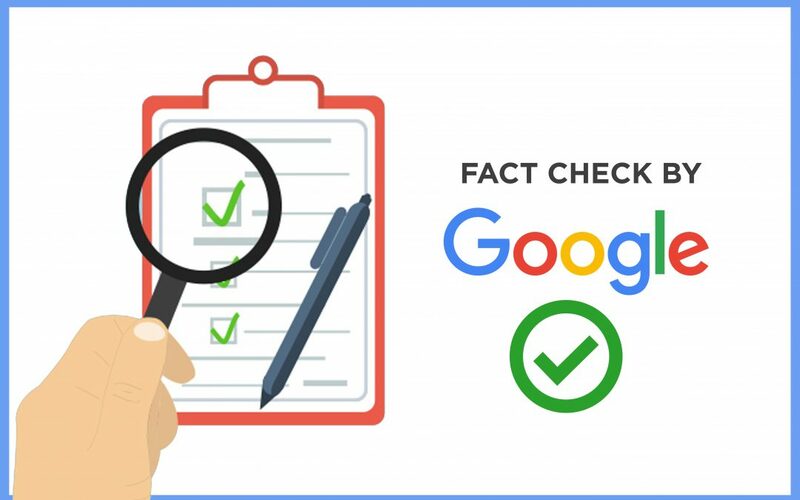 Google’s fact checker appears to use not just website content for validation but topical relevancy (sitewide content), topical authority (site-wide links), and, most importantly, backlinks. If you’re investing in SEO, chances are you’re already focused on these three things. That means your site may be well on the way to serving as a validation source. 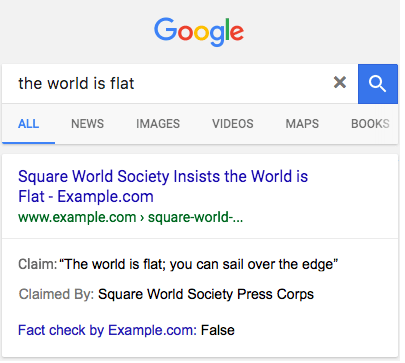 Google’s fact checker has been in beta for some time and is only now coming into wide use. That means we don’t always know precisely what triggers a site to get selected as a validation source. Yet the key ranking factors – relevance, authority, and links – are likely to be important to the fact checker. In addition to following standard enterprise SEO best practices, there are two specific steps you can take to serve as a source of validation and gain additional exposure on the SERP. If you want to serve as a resource for validating what’s going on in the news, you must be able to create content quickly. Is that to say that you want to be an authority for everything newsworthy? No, of course not. But it’s important to recognize what people are talking about in your space and consider how you can be part of the conversation. In this case, a bank could simply enhance its locations page with a sentence like “Bank X has 5000 locations nationwide and we’re adding more every year.” If Bank X’s website has strong authority and relevance for location-related searches, there is a good chance it will serve as the validation source for that particular query. One quick-and-dirty approach to staying abreast of the news is Google Trends. Trends helps you identify not only what topics are trending but how their search volume changes with time. Google Trends, combined with Google Alerts or a similar tool, can keep you on top of the news cycle. What’s really essential, though, even more important than relevance from fact checkers’ perspective, is the technical side of things. Across your blog, resource section, and insights section – anywhere you think you have information that can validate media claims – you should be prepared to add markup language (i.e., schema). What you want to do is use the <ClaimReview> markup to surround your authoritative content. Keeping with the bank example, if one of your credit cards has a competitive rate, you might publish a table that shows different cards’ interest rates, then wrap the table in the <ClaimReview> markup tag. This tag alerts search engines that your content may be used as a source of validation. What kinds of content are appropriate for <ClaimReview>? Does Bank X have the lowest mortgage rates? Are 401ks better than Roth IRAs? Is it smart to get a personal loan to secure a down payment for a house? Is it true that I can get a home loan with bad credit? Consider when and how you can deploy the <ClaimReview> markup on both your product pages (which can address branded queries) and your educational pages (for more general queries about your vertical). Read Google’s guidelines to including ClaimReview structured data on your web page here. It’s becoming more and more apparent that schema is how AI will interpret data. We’re seeing this today with voice search and SERP snippets; Google typically favors schema-tagged content for both result types. That means if your goal is to own more of the SERP for your target keywords – and it should be – schema will be absolutely critical. Combine this technical best practice with topical content and you’ll be well positioned to win with fact checkers. Is your enterprise website ready to be considered authoritative and relevant by Google, enough to be used as a verification source? If you have any tips to add here, or any questions, write to us here.